Taking place after Apple and Microsoft’s keynotes in the last couple of weeks, Google’s keynote for Google I/O 2012 revealed Android 4.1 Jelly Bean, the Nexus 7 tablet, Nexus Q media streaming device, and a focus on integrating Google’s services through social sharing. While the biggest announcement was Jelly Bean, the other upcoming releases show how Google is looking towards integration across all hardware supporting by Google services. We rounded up some rumors about Jelly Bean and while we weren’t entirely right, they’re still a wishlist. If you’re still running Android 2.3 Gingerbread, it’s time to upgrade. Forget Android 4.0 Ice Cream Sandwich (ICS), 4.1 Jelly Bean is the operating system you want. Google focused a lot on the user experience (UX) in Jelly Bean. The user interface (UI) hasn’t changed from Ice Cream Sandwich. The improvement is a greater amount of customization and gesture control. 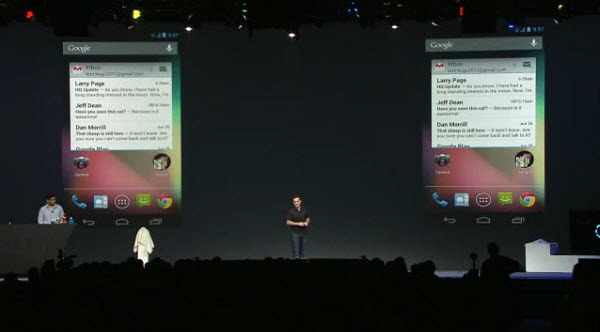 On the homescreen for Jelly Bean devices, widgets and apps will auto-resize to fit available space. Text input has a refined and tuned dictionary with a better predictive keyboard. Offline Voice Typing is the biggest feature. Before, it required a data connection to use dictation, but now it will be included inside the OS. 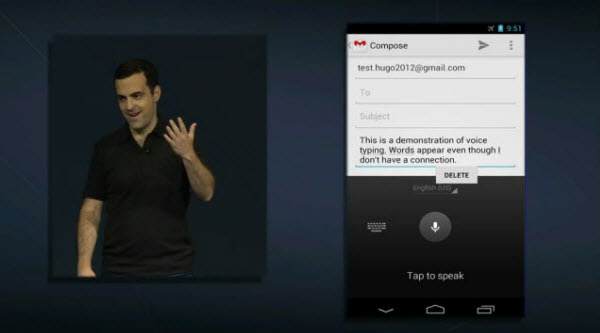 Improved gesture support flows into almost all parts of Jelly Bean. In ICS, to remove apps or widgets from the homescreen, you had to drag them into a trash can. Now you can just swipe them off the screen. Gestures for the disabled included a touch-and-swipe plus speech function for blind users and platform support for braille through Bluetooth. The native camera app updates with gesture support too. Swiping in different directions performs new actions, but you can still recover accidentally deleted pictures. Android Beam gained some extra functions like the ability to pair with a NFC-supported device like current Bluetooth devices. Notifications have upgrades. From the notifications bar, you are able to interact with social apps and even respond to calls straight through the menu. From the notification, you can call missed calls and hang up when you’re done. Social interactions from Google+ were demoed showing the ability to +1 along with foursquare. It won’t be surprising to see Twitter and Facebook integration there when it launches. Search received a new, redesigned UI with a faster and more natural search through text and voice. It shows cards as the first result with the most specific information to your question and below shows a web search. Jelly Bean’s search feels more organic and gives more relevant results. Google Now is probably the biggest Android 4.1 Jelly Bean announcement. A location-assistant, Google Now learns your habits through the use of Google services. An example was Google Now learning the commute you take to work and suggesting alternate routes. It can also tell you information about public transit like when the next train arrives. For places, it can suggest information like what a restaurant is best known for. It can update information for flights, keep track of sports, and should include other updated information. You can use Google Now by tapping on search or swiping up on the screen. Android 4.1 Jelly Bean is also including new app encryption so it may be impossible to pass around application files like before. Google is including a device specific key that is going to be included with all application files. A new feature is Smart App updates. This will only download update-specific files for apps rather than download the entire app again. Smart App Updates will be supported on Android 2.3 Gingerbread and higher. 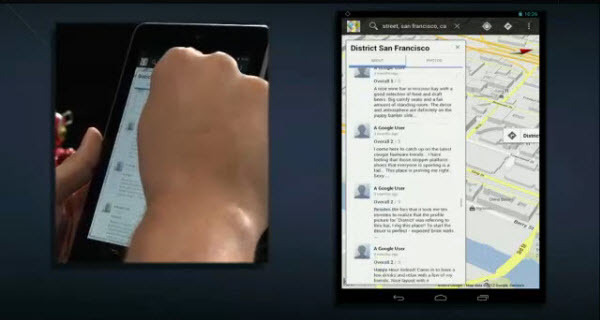 Google took the chance with their announcement of Jelly Bean to display updated apps on their new tablet. The Nexus 7 featured the updated Google Play Store. Google Maps received an update with the previously mentioned offline maps along with an in door Compass mode supported by gyroscopes in devices. The demo showed was interesting, but it will depend on how many businesses allow interior images to be uploaded to Google for this feature. Google Currents was updated to support Google Translate. You can now translate entire pages into another language. Chrome is now the official browser for Android 4.0+. Just like using the Nexus 7 to show off Jelly Bean’s new apps, Google announced the Nexus Q, their new media streaming hub. Using your Google account, you control the Nexus Q through an Android tablet or smartphone to stream your media content. By using cloud streaming, you can play movies, television shows, and music to different hardware. The strong social interaction was demoed by being able to stream music from multiple Google accounts at the same time. Making a virtual playlist, friends can add their music from Google Play Music to the Nexus Q. They also demoed playing a movie clip. The final update was for Google+. 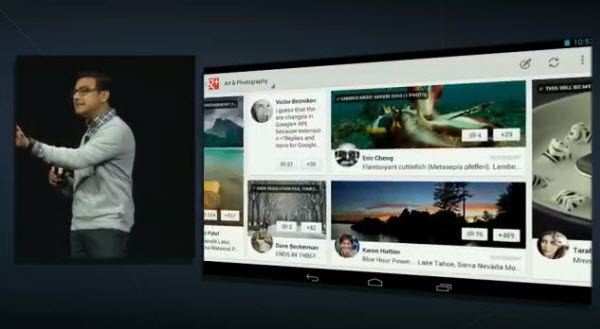 A tablet-specific version was demoed revealing a new UI and the announcement of Google+ Events. Events allow you to create a group that can interact with each other joined through event. Google showed how pictures can be tagged specifically and uploaded in real-time. This creates a photo album that is created socially. Google+ also added calendar integration so you can accept invites straight from Google+, connecting the services together. Android 4.1 Jelly Bean is an impressive update. It features a lot of UI and UX improvements that needed to be addressed. The greater usability of notifications puts it a step above iOS 6, in my opinion. The customization doesn’t change the core feel, but lets users create an individual home screen. The greater focus on overall integration for Google services shows with Google Now and Google+. 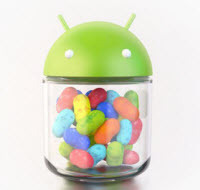 Android 4.1 Jelly Bean is rolling out to the Galaxy Nexus, Motorola Xoom, and Nexus S in mid-July. Hopefully other device manufacturers will be faster in releasing this update to devices that can support it.